PORTLAND, Ore. Obie, a dachshund who made headlines after he reached 77 pounds, has recently underwent reconstructive surgery after his 40-pound weight loss. Veterinarians at Oregon Expert Vets in Tualatin, Oreg. removed 2.5 pounds of loose skin from the formerly obese dog. 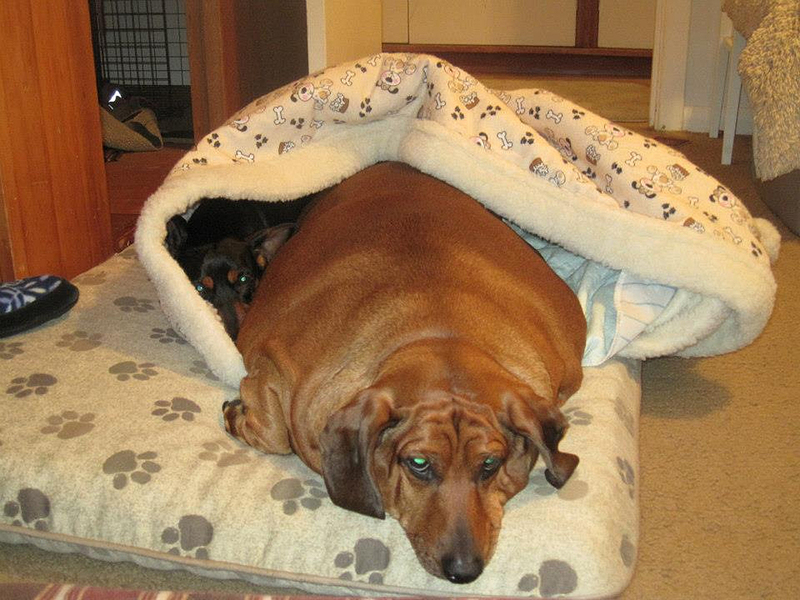 He weighed 37 pounds and 4 ounces at the time of his surgery on Tuesday, according to his official Facebook page, Biggest Loser, Doxie Edition. "I don't know that this surgery has ever been performed on a dog before after a significant weight loss but it will be similar to doing a mass removal procedure," owner Nora Vanatta wrote. Yesterday, Vanatta wrote that Obie was doing very well post-procedure, and was able to sleep. He was able to eat breakfast and use the bathroom, and is at home recovering. Obie isn't up to regular walks and play yet, but he is expected to be at his usual energy levels soon. Ideally, Vanatta said that Obie should weigh between 28 to 30 pounds so he has a little longer to go on his weight loss journey.